We all know that Halloween is a time to pull out your scariest costumes and accessories. After all, the night will be populated with all sorts of witches, vampires, monsters and ghosts. You don’t want to be left behind when the rest of the ghouls are partying loud enough to wake the dead (maybe literally). There’s nothing worse than being the only non-scary creature at a haunted house party. That’s why you’ve got to put extra care into your costume. This is no time to throw a white sheet over your head and call it good. That sort of half-hearted throwaway attempt might have gotten some chuckles when you were a kid, but this is the big leagues now. If you’re going to hold your own against a vampire with red contact lenses and a werewolf covered in real fur, you’ve got to really nail your ghost costume. 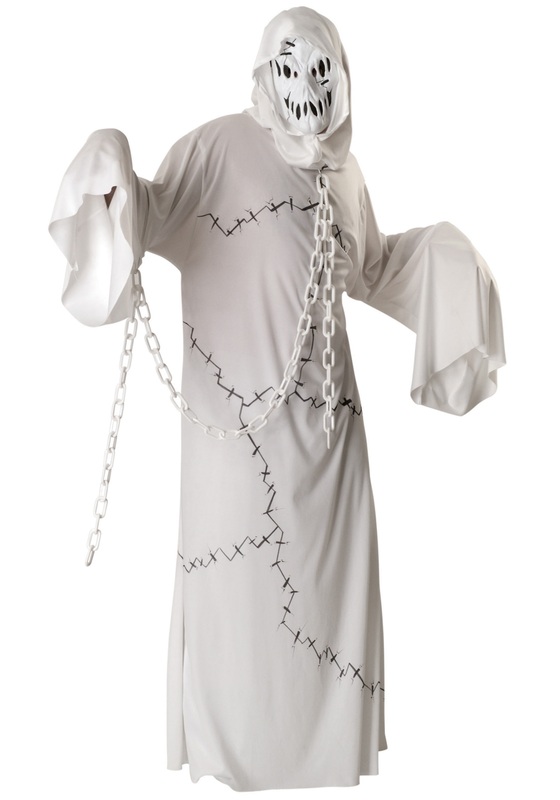 Luckily, you have a secret weapon: this Terrifying Ghost Costume. This is not your grandpa’s ghost (we hope!). It’s something guaranteed to cause nightmares for weeks to come. The white hooded robe is covered in printed stitching, while the mask adds a terrifying extra layer. It also comes with a 4-foot long gray plastic chain for an extra special touch. Put this on, and you’ll definitely be the ghost with the most no matter what house you’re haunting! The costume was easy to wear and comfortable. I like a mask instead of having any crazy makeup on my face. It was like wearing pajamas and I was fully dressed and appropriate for any age party but enjoyed an adult party and mask was comfortable & easy to wear. The chain was not as long as it appears in photo but was just perfect to complete outfit & I tied my e-cig to chain. Thank you!! !